Black: The coat should be solid coloured with deep brown eyes and a black nose. Brown: a nice rich even coffe brown colour that remains throughout the dog's lifetime. The nose is rose, matching the coat colour. Cafe: coat tends to be a faded chocolate to a creamy or silvery brown . Eyes of a lighter golden brown (hazel), or green. Born a dark shade, the coat fades until 1-3 years of age. Nose colour is rose. Our female Kinsley is cafe coloured. Parchment: puppies are a shade of chocolate and fade into a light creamy brown. Colour change usually apparent by 6 weeks of age. It is common for parchment dogs to have a slightly darker shade to face, ears, legs, and tail. Nose is rose. Eyes are hazel or green. Red: a true uniform red colour from the roots to the tips of the dog's coat. Colour does not fade with age. Red dogs will have black noses and dark brown eyes. Red Rose: rich red colouring throughout the coat, but with rose pigment and hazel or green eyes. Blonde Rose: a cream coloured dog with a rose nose and hazel or green eyes. Blonde: a warmer shade than white with gold tints. Nose should be black in colour. Eyes are dark brown. Our female Carys is cream. White: a cool, stark white with black coloured nose and dark eyes. White Rose a cool white coloured dog with a rose coloured nose. Eyes are hazel or green. Gold: a warm rusty gold or apricot that has even colouring throughout the coat. Nose is black in colour and eyes are dark. Silver: puppies are born black and then gradually fade to a shade of grey. Nose pigment is black and eyes are dark. ​Phantom: a solid base colour with a distinctive set of tan markings. Nose and eye colour should match the base coat colour. Our female Beatrix was born a chocolate phantom Cobberdog (she has faded now to a parchment) . Parti: patches of colour on a white background that must be at least 50% of the dogs. Luken is a brown and white parti colour. Some of the Australian Cobberdogs colours more likely seen in our programme are listed above. There are more colours that may appear such as Raven, Blue, Lavender, and Merle. 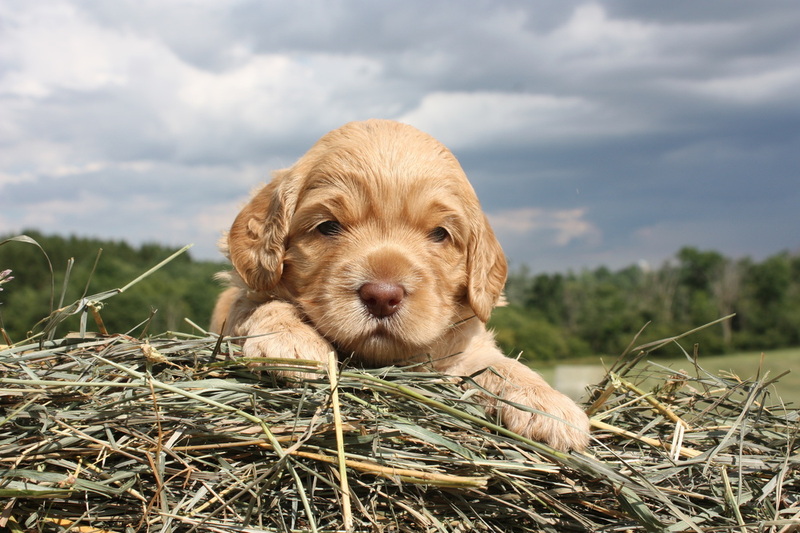 The colours that may appear in an individual litter are determined by their parent dogs' genetic combinations.